PRODUCT: Falltech #7410 Re-Useable Hinged Roof Anchor, Yellow Chromate Finish. DESCRIPTION: The #7410 reuseable roof anchor is constructed using rugged 11 gauge alloy steel with a yellow chromate finish. It easily installs to fit any pitch roof. Can use screws or 16D nails (not supplied). * Conforms to any roof pitch. 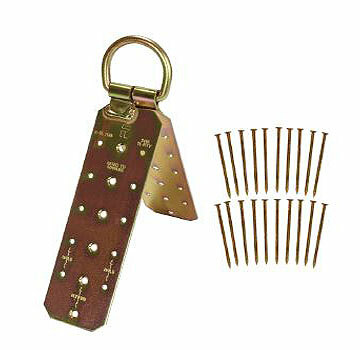 * Hinged D-Ring is 2-7/8 wide x 3-3/4"
* Each leg is 3" wide x 10" Long, with 16 countersunk screw holes. * Fully compliant with OSHA and ANSI requipments. * Rated 5,400 lbs., Capacity 310 lbs. * User Instruction Manual included.